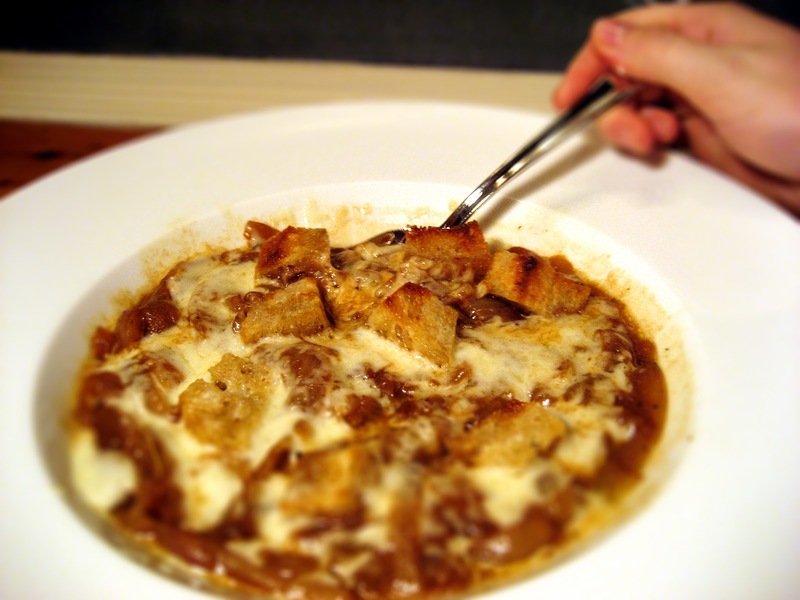 French Onion is my favorite broiled-cheese-topped soup. This soup is so simple, even a caveman could make it. And perhaps cavemen did make French Onion soup. Though, at that time, it would have probably been Pangea Allium Soup, seeing as France wasn’t formed into a state until 843 AD and our earliest traces of the modern onion extend only to the Caananite Bronze Age. You just got better at Trivial Pursuit. Anyway, here’s the recipe. Peel the onion and chop it into long, thin pieces. Here’s how: cut the onion from pole to pole, through the root end. To avoid looking dramatic and running your mascara, remove the gland at the root of the onion by cutting out a wedge. This will abate all those tears, you sissy. Now, lay the flat side of the onion on your cutting board so you have an onion hemisphere pointing up at you. With the root end facing you, slice the onion in thin strips parallel with the poles. Heat a large, heavy saucepan over medium heat. Add the butter and sauté the onions until soft and golden, about 10 minutes. Add the beef broth and bay leaf and bring to a boil. Reduce the heat to a simmer and cook for about 15 minutes or until the broth has reduced by about 25%. This is also a good time to salt and pepper to taste. Remember to blow on the soup, as it will be hot you idiot. Meanwhile, cut the crust off of your french bread. Then, cut the uncrusted loaf into large cubes, about 1″. Feed the crusts to the rats living in your walls – one of them might secretly be a gourmet chef. Toss the cubes in olive oil and lightly toast them. I used my toaster oven on 350F for about 10 minutes, but you could do just as well in a warm skillet. The key is to get the cubes just the slightest bit crunchy. You don’t want croutons here, just firm bread. When you’re ready to bowl up, turn on your broiler and set the top rack about 8″ beneath the heating element. 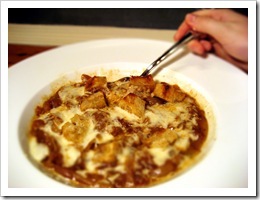 Ladle some soup into an oven-proof bowl and top with a few cubes of French bread. Top the whole thing off with a generous drizzle of cheese and broil until the cheese is brown and bubbly, about 30 seconds. Use oven mitts to remove the bowls. Enjoy on a cold, civilized evening with a bottle of wine, dippin’ bread and the fossils of fallen Neanderthals. nice I LOVE! the sour dough bread (French) with parmesian cheese and oil yum!